We’d love your help. Let us know what’s wrong with this preview of The Becket List by Adele Griffin. Everything is changing for Becket Branch. From subways to sidewalks to safety rules, Becket is a city kid born and raised. Now the Branch family is trading urban bustle for big green fields and moving to Gran’s farm, where Becket has to make Adventure and discover with the bold and intrepid Becket Branch when her family’s move from city to a country farm means big changes! To ask other readers questions about The Becket List, please sign up. 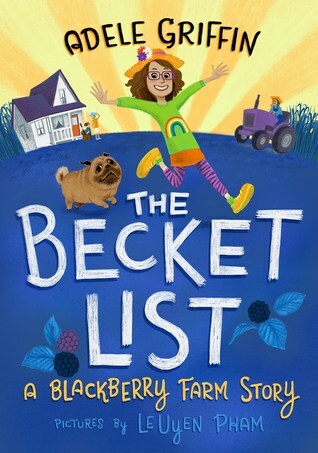 I started reading The Becket List: A Blackberry Farm Story on 1/7/2019 and finished it on 1/14/2019. This book is an excellent read! I like Rebecca also known as Becket. She's an easy going person who has a positive attitude to everything. She embraces her family's decision to say goodbye to city life and move to the country. She doesn't laugh at her twin brother for being afraid of dead bugs but instead helps to make him feel more comfortable in his new surroundings. Even when life in the count I started reading The Becket List: A Blackberry Farm Story on 1/7/2019 and finished it on 1/14/2019. This book is an excellent read! I like Rebecca also known as Becket. She's an easy going person who has a positive attitude to everything. She embraces her family's decision to say goodbye to city life and move to the country. She doesn't laugh at her twin brother for being afraid of dead bugs but instead helps to make him feel more comfortable in his new surroundings. Even when life in the country puts her in an unexpected place, she pushes back with a fight rather than accepts defeat. This book is told in the first person point of view following Rebecca "Becket" Branch. She has a big sister named Caroline who is finishing sixth grade and twin brother named Nicholas who is finishing third grade. Her family is packing up and moving to Blackberry Farm where her Veterinarian parents will take over the town's Animal Clinic and help out her Gran run the Farm Store. The twins are as different as they can be. Becket has a positive attitude to change while Nicholas is not. Moving to the country also means Becket will no longer share her room with her big sister, and that's a change she isn't ready for. A girl up for anything, Becket creates a list to make sure she will do everything to be a country kid even when life in the country isn't always a smooth ride. The Becket List is very well written and upbeat. I love that Becket is a team player, an easy going daughter who is okay with everything tossed her way. Often I feel her parents are harder on her than on her twin, Nicholas because she's tasks with all the chores and he doesn't. I do like reading about an opposite character from Becket because it helps me to understand that some kid takes longer than others to agree to change. I like that their parents sign them up to summer activities anyway even knowing Nicholas will not embrace it immediately. I like the story on Mr. Fancypants, their dog. I love his naps by the shaded tree under the sun. The comparison between city life and country life is interesting and I highly recommend everyone to read this book. ***Disclaimer: Many thanks to Algonquin Young Readers for the opportunity to read and review. Please be assured that my opinions are honest. This book was such a cute surprise. Rebecca "Becket" has always fit in with her city life - but when she moves to the countryside with her family to take over their farm, Becket realizes that it's harder than it seems to make new friends and fit in into a new world. This was such a quirky read. Becket is funny, ambitious and so energetic, she was nearly bouncing off the pages with her unbridled enthusiasm. When Becket sees something pretty, she yells out "beautiful alert", she faces down a terrif This book was such a cute surprise. This was such a quirky read. Becket is funny, ambitious and so energetic, she was nearly bouncing off the pages with her unbridled enthusiasm. When Becket sees something pretty, she yells out "beautiful alert", she faces down a terrifying raccoon, and makes friends at camp with her kind and thoughtful gestures. By helping out around the farm, studying other children and spending time with the family dog that she'd like to trade in for a newer model, Becket finds her place in this new life. I thought that Rebecca deciding to change her name to Becket was a lovely addition to the book; it certainly made me feel like reading something special. The family and friends dynamic was also lovely and will help children to see that while we outgrow some friendships, others are certainly worth holding on to forever. This is a great story about growing up and life changes. Becket goes through many changes in this book. At the beginning, her family moves to her grandmother’s farm. She has to adjust from city life in an apartment to country life on a farm. She also goes to a camp, but it is very different from the camp she used to go to in the city. She doesn’t make friends as easily as she did before. I loved that Becket had to deal with all of these changes in this book, because often kids books just focus on This is a great story about growing up and life changes. Becket goes through many changes in this book. At the beginning, her family moves to her grandmother’s farm. She has to adjust from city life in an apartment to country life on a farm. She also goes to a camp, but it is very different from the camp she used to go to in the city. She doesn’t make friends as easily as she did before. I loved that Becket had to deal with all of these changes in this book, because often kids books just focus on one kind of life change rather than many different ones. I loved the pictures in the book. There were some at the beginning, but they tapered off towards the end. I had an ARC so this may have changed in the final edition, but I would have loved to have even more pictures because they were so great! The one thing I didn’t like about this book was the ending. I won’t spoil it, but something happens to one of the animals. It was upsetting to me, because I could relate to it, which made it difficult to read. Things happen to animals as part of life on a farm, so I understand why it was in the story. However, I don’t like reading about things that happen to animals, so it is a personal preference. I really liked this story. It’s great for middle grade readers. "Beautiful Alert! ", Becket is going to steal your heart. Becket was more than ready to start her new life in the country. She even had a list to help her become an official country kid. So, Becket was ready for the country, but was the country ready for Becket? It was love at first page! Becket had such a wonderful voice, and I adore all her energy and enthusiasm. I swear, the kid should be a motivational speaker, because her zest for all things was contagious. Though Becket was excited about all "Beautiful Alert! ", Becket is going to steal your heart. It was love at first page! Becket had such a wonderful voice, and I adore all her energy and enthusiasm. I swear, the kid should be a motivational speaker, because her zest for all things was contagious. Though Becket was excited about all the new things she was going to experience, her confidence waned a little, here and there, as she adjusted. But, I was rooting for her the whole time, because she was so fabulous, fantastic, and spunky. Since Becket was (almost) 10, we spent a lot of time with her family. We got to peek in on their daily interactions, and what a lovely family they were. I especially loved Gram. She was warm and wonderful and filled that soft spot I have in my heart for grandma's. When I was 13, my family moved from Brooklyn to a 1-square mile town in NJ. Though it wasn't as "country" as Becket's new home, it was a big change from my former home. I really related to the the adjustments Becket had to make, and also really loved the look into what it's like to live on a farm. We saw the awesome and ugly sides of it, but this all tied into the overall theme of this book, which was about embracing change and adapting when necessary. I definitely smile a LOT as I read this book. I did wonder why so many people were trying to stifle Becket's enthusiasm by telling her to quiet down all the time, and I won't even mention what happened in the last chapter, because I have already cried a smile river about it, but overall this was fun and wonderful book, where I got to take an adventure with an enchanting character as she embraced and adjusted to her new normal. So much fun! This is an upbeat, cheerful novel about a young girl who moves with her family to the country from the big city. She's loud, quirky, and stubbornly optimistic--even when her siblings insist on being grumpy about the move. Adjusting to a new life is hard, but Becket has a plan, and a list, to help with that. Of course, nothing ever goes according to plan and Becket learns that life in the country may be different than she expected. But with Becket's can-do attitude and her vibrant per So much fun! This is an upbeat, cheerful novel about a young girl who moves with her family to the country from the big city. She's loud, quirky, and stubbornly optimistic--even when her siblings insist on being grumpy about the move. Adjusting to a new life is hard, but Becket has a plan, and a list, to help with that. Of course, nothing ever goes according to plan and Becket learns that life in the country may be different than she expected. But with Becket's can-do attitude and her vibrant personality, it doesn't take long before she's feeling like a real country-kid. If you're looking for books that are sweet, fun, quirky, positive, and cheerful, this is your book. Kids that like animals and funny main characters will enjoy this little gem. I will certainly purchase this book for my library when it’s out. Becket (formely Rebecca) is such a funny, energetic character that continually finds herself in trouble. A spiritual successor to Ramona Quimby, but a fish out of water tale set in farmland. Life on a farm flips into a whole new light with never ending energy and silly insights. Rebecca's family is leaving the city apartment and heading out to a farm, and she's got the perfect list on the amazement of farm life. So far, her list only has one item, leave the city. But changing her name to something more farm fitting only begins her increasing list. Now know as Becket, she's ready to become the true farm girl with so much enthusiasm that it leaks off the pages as she explores what life Life on a farm flips into a whole new light with never ending energy and silly insights. Rebecca's family is leaving the city apartment and heading out to a farm, and she's got the perfect list on the amazement of farm life. So far, her list only has one item, leave the city. But changing her name to something more farm fitting only begins her increasing list. Now know as Becket, she's ready to become the true farm girl with so much enthusiasm that it leaks off the pages as she explores what life in the country really is like. Becket is a ball of energy pure. Everything she does, even eating dinner with her family, turns into excitement with a twist of thoughts, which border on ridiculousness without ever stepping over the line. The story, while an easy read, holds a very quick pace thanks to her bubbliness. As to real adventure in the traditional sense, there isn't much beyond every day life and situations. But it's exactly these moments that portray life in the country, which Becket molds with a sense of excitement and exploration. The authors manage to bring across a fairly real impression of what life on the farm is like, something city kids will find intriguing. Still, the simpleness of this life (or not always as simple as it appears with Becket) is exactly the adventure in these pages. It's Becket's rambling, constant, can't-be-turned-off enthusiasm which makes this a fun read, one that even more reluctant readers will be willing to grab up. Rebecca’s family is moving to the country and 3rd grader Rebecca is the only one excited about it. Her twin brother Nicholas is afraid of everything in the country, and her older sister is unhappy about having to leave her best friend behind. They will be moving to the farm where her Gran lives, and her veterinarian parents will take over the Old Post Road Animal Clinic. Rebecca is bent on applying her city smarts to country living and begins by adopting a country nickname — Becket. Becket has a list. She knows exactly what she wants to accomplish in her first summer out at Branch Farm. While working through her list, she is faithful in looking for Beautiful Alerts to share with those around her. Making new friends is not as easy as this outgoing girl thought it would be. What she does realize, though, is the many ways she can help out with the animals on the farm and their very own aging Fancypants. This is a fantastic book for kids who are at chapter book stage. There are Becket has a list. She knows exactly what she wants to accomplish in her first summer out at Branch Farm. While working through her list, she is faithful in looking for Beautiful Alerts to share with those around her. Making new friends is not as easy as this outgoing girl thought it would be. What she does realize, though, is the many ways she can help out with the animals on the farm and their very own aging Fancypants. This is a fantastic book for kids who are at chapter book stage. There are fun illustrations to go with the text. Readers will learn about family, loyalty, trust, transition and cooperation when spending time with Becket Branch. Rebecca and her family are moving from the city to Gran's farm. Rebecca makes a list of 10 things she needs to do to become a country girl. First thing is to change her name to Becket. Life was exciting and easy for her in the city, and she thinks it will be just as easy for her in the country, but surprises are in store. She yells "beautiful alert!" anytime she hears or sees something beautiful. She assumes making friends will be a snap, since she had lots of friends in the city, but her nervous Rebecca and her family are moving from the city to Gran's farm. Rebecca makes a list of 10 things she needs to do to become a country girl. First thing is to change her name to Becket. Life was exciting and easy for her in the city, and she thinks it will be just as easy for her in the country, but surprises are in store. She yells "beautiful alert!" anytime she hears or sees something beautiful. She assumes making friends will be a snap, since she had lots of friends in the city, but her nervous brother finds friends much quicker than she does. She takes care of the chickens, donkey, and mule, and begins to appreciate their creaky, ancient dog. Her family is quietly supportive. I love the main character's "Beautiful Alerts." Becket Branch (formerly know as Rebecca) is trying to adapt to life in the countryside after her family moves from the city to the family farm. What worked for her in the city is not working now, and she is dismayed to see her twin brother making friends and fitting in more easily that she does. Becket never gives up and always looks for the good in people and the beauty in her surroundings. She is prone to call out "Beautiful Alert" when a flower I love the main character's "Beautiful Alerts." Becket Branch (formerly know as Rebecca) is trying to adapt to life in the countryside after her family moves from the city to the family farm. What worked for her in the city is not working now, and she is dismayed to see her twin brother making friends and fitting in more easily that she does. Becket never gives up and always looks for the good in people and the beauty in her surroundings. She is prone to call out "Beautiful Alert" when a flower or a sunset or the sight of a loved one moves her. Becket reminds me a a slightly grown up Clementine. I was sent this arc to read and review with my honest opinion and I highly recommend it! The Becket List is such a sweet and funny read. I actually connected to the story way more than I thought I would. I’ve never lived on a farm but Becket has this personality about her that you will fall for and find yourself in. Mr. Fancypants is very near and dear to my heart. There is great representation in this book. Trust me when I say you’ll love Becket. I was given a digital copy of this title, free, in exchange for my honest review. This was a cute story about a girl who moves from the city to the country with her family. While there are things that she enjoys about city like, she is really looking forward to life in the country. Things do not go the way that she imagines them going and she has some fun adventures in the process. It was a short and quick read, but the ending left me wanting just a little bit more of an ending. I really enjoyed this book! Becket is funny, kind, and original. There are a few illustrations throughout that help bring the story alive. I would hand this to patrons who’ve outgrown Junie B, the Dory books, Mercy Watson, and the like. All have humor, heart, and family. This was a very sweet book and I enjoyed it very much. Thank you to the publisher for an ARC. Becket Branch and her family are making a big move. They are moving from the city to a farm out in the country. Becket is embracing country life with both hands. She is a very enthusiastic little girl who is sure that sh Today is publication day for The Becket List by Adele Griffin. This is a Young Readers book that I received in exchange for my review. This is not the age level of book that you might to expect to find here but you might have a young reader in your life who is looking for a book. The Becket List by Adele Griffin was released on 3.12.19! “BEAUTIFUL ALERT!” This adorable, corky book will warm your heart and leave you smiling! As Becket’s (formally Rebecca) family packs up to go live on their grandmother’s farm, her siblings are not as excited about moving as she is. Becket is ready to leave the city and begin exploring the country as she begins her “How @kidlitexchange #partner Thanks to the @kidlitexchange network for the review copy of this book - all opinions are my own.